Genre: Political drama, light action. Notes: Based on the manga by Aida Yu, serialized in Monthly Comic Dengeki Daioh. The Social Welfare Agency continues its work as government operatives producing and utilizing cyborg girls for the job. While Henrietta and Rico still searches for acknowledgement from their handlers, Triela encounters a new problem in the form of Pinocchio, a teenage boy trained in the arts of assassination. Defeated, but not killed, Triela takes her loss like you'd expect a cyborg teenager full of pride would. 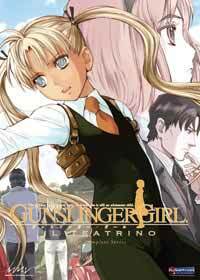 When I first decided to purchase the original Gunslinger Girl, I had some concerns over the highly controversial material and whether I'd be able to accept it and enjoy the show for what it was. Upon getting it, I quickly found out that the show was not one to enjoy in the word's most literal sense. Gunslinger Girl is an abrasive and cruel show, its jarring sensibilities constantly at odds with the story. It was also beautiful in the way only a truly twisted show can be, and, as such, definitely worth the money spent. So, when I put in the order for Il Teatrino, I had a rather different set of apprehensions to fight back. See, a long time before the license, I had learned about the change in art and animation, and while I'm normally not that big of a stickler for perfection in that particular area, the difference still had me worried. Because whatever you've read, whatever you've heard; it's all true. Il Teatrino just looks... well, not entirely irredemable, but pretty pedestrian compared to the first season. The best example -- an ill-handled scene in the first episode centered around a riot in Rome -- is awkward in the worst ways imaginable, its lousy animation attempted hidden behind a constantly shaking camera. Furthermore, I hope you like speed lines, because the action scenes have enough of that to go around. In other words, meet the dealbreaker. If you can get over this, however... which I did, after some mental wrasslin' of my own... you'll still find the show to be as familiar as ever. Like the first season, Il Teatrino still holds true to the manga, for good or ill. In fact, this second season introduces us to a good number of the opposing party; the Padania. Not only are we getting a lot more of Franco and Franca to go around, but Pinocchio and his ward Christiano also rounds up the side of the "terrorists". And, much like how the SWA has a cast of moral variables, so does the Padania. Though the SWA makes up the "heroes" in Gunslinger Girl, the show still takes a neutral stance for the most part. At the core, however, the show is still mostly about the girls and their "brothers". In that, it's as disturbing and endearing as always. The root of the problem I have with this show, which was my main concern before getting it at all, was that there's no way to give the whole issue with cybernizing little girls a positive slant, especially when it's for violent means. The crazy part is that you could make a point that the girls' innocense is lost, but is still intact somehow. Like most children, the girls tend to seek approval with their parents, or -- as is the case here -- with the one they consider to be the family leader (as it were.) It's a tricky subject, and particularly notable with the characters of Henrietta, Rico and Angelica; who are the youngest of the girls. You just don't watch them shoot and kill people, and then feel endeared when they giggle happily when being praised by their handlers for a job well done. But you can still feel good about the fact that, at least outside of work, they have the chance of continuing being children, or in the case of Triela and Claes; teenagers. Of course, one might also argue that anything would be better than having to live with the fates the poor girls were dealt before becoming cyborgs in the first place. I'm not here to make that argument, and furthermore, if you're reading this, you've probably already come to a conclusion about that with the first season. Said fates were covered with Henrietta, Rico and Angelica in that very season, and in Il Teatrino we also learn what happened to Triela, and how she came to be with the SWA. In fact, most of the show is basically centered around Triela and her clashes with the fully human Pinocchio. We're also being put into the heads of some of the... shall we say "more upstanding" members of the Padania; the bomb-making terrorists, Franca and Franco in particular. Unlike the first season, Il Teatrino puts forth a show including both sides of the argument, with their clashes and intermission conversations and soliloquies and internal politics, and this is why even Il Teatrino can be considered a worthwhile show despite the cheap design values and clumsy direction. I'd be lying if I said I never wished the second season was handed over to a better studio, but even if Artland is the only company willing to handle further seasons of Gunslinger Girl, I would give them a chance (and hopefully a bigger budget would help as well.) Because behind all this madness, all this apparently cynical exploitation of children for own ends, this show really has a heart underneath it all. There is a certain inevitability in Gunslinger Girl that, if followed up on, will probably break my heart. The art and animation quality can and will be the wedge that may or may not prevent you from enjoying this show -- I've already witnessed this among my fellow friends and colleagues on the site and outside -- but if you think you can live with this loss, Il Teatrino will otherwise provide you with what you want to see. Recommended Audience: Like in the first season, Il Teatrino has some rather heavy scenes of violence, particularly some of the fights near the end. There's also the whole "using little girls as assassins" aspect that's bound to piss people off, although they would probably not be reading this in the first place. Also, Triela's backstory is no walk in the park. Even though you don't see it happen, the details of what happened to her are very clear. Other than that, it's your typical action fare.